After taking a look at Scott Voth’s (@scottvoth) new layout for his Wiki Wrangler blog I had an idea to revamp my own. I changed my theme from Fervens A 1.1 by Design Disease to Magatheme 1.0.4 by Bryan Helmig. While the new theme wasn’t as flashy as the Fervens Theme, I was tired of the old color scheme and wanted something with more of a newspaper type of feel. I also reworked the widgets on my sidebar. 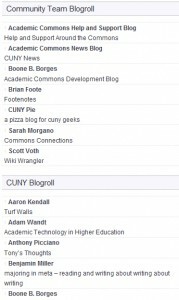 I wanted a blog that felt a little less cluttered so I deleted the RSS feeds from the Community Team blogs and opted for a simple list of blogs that were associated with the Academic Commons Community Team. My process for this was simple… I selected ‘Add New’ under ‘Links’ on the left navigation bar of my Dashboard. From this point I added the name of the blog’s author under ‘Name’, cut & pasted the appropriate URL in the ‘Web Address’ bar and added the name/tagline of the blog under ‘Description’. Then I added the category ‘Community Team Blogroll’ to better organize the links. I decided to have the links open in a new window by selecting ‘_blank – new window or tab’ under ‘Target’. Lastly, I selected the ‘Add Link’ button on the top right side of the page. I didn’t stop there because I got thinking about the many blogs that belong to members of the CUNY community that are housed outside of the Commons. I wanted to provide a comprehensive list of blogs for members to browse, get ideas, access information, etc… To facilitate this new idea I searched through blogs linked to a given member’s profile and followed the same process as listed above. The only difference is that I created a new category ‘CUNY Blogroll’ to organize all these blogs. In order to make the Community Team Blogroll and CUNY Blogroll links appear on my blog, I added the ‘Links’ widget to my sidebar then selected ‘All Links’, ‘Show Link Name’ and ‘Show Link Description’. Lastly, I chose what position I wanted to links to appear in relation to my other active widgets and selected ‘Save Widget’. 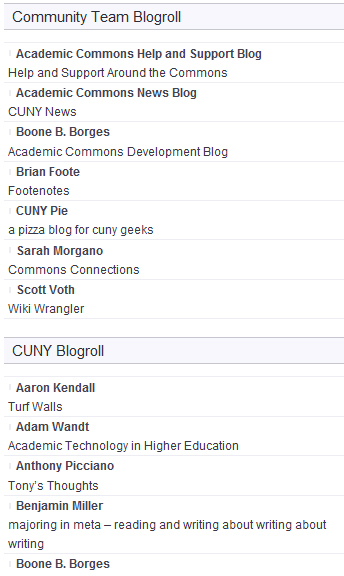 While I have gone through many members’ profiles in order to add blogs to the CUNY Blogroll, (and get to know a little more about everyone) I’m sure there are many missing from the blogroll. If you would like to add your blog please feel free to message me the blog URL and I will gladly add it to the CUNY Blogroll. PS– The other active widgets on the sidebar of my blog are ‘Subscriptions Options’ and ‘Tag Cloud (Simple Tags)’, which can be found under the ‘Plugins‘ on the left navigation bar of your dashboard (picture above). Interestingly enough I was able to sync my podcast feed URL with the green email icon under ‘Subscriptions Options’. Metablogging is fun.